Welcome to the final ASUG Business Intelligence Community newsflash of 2018. 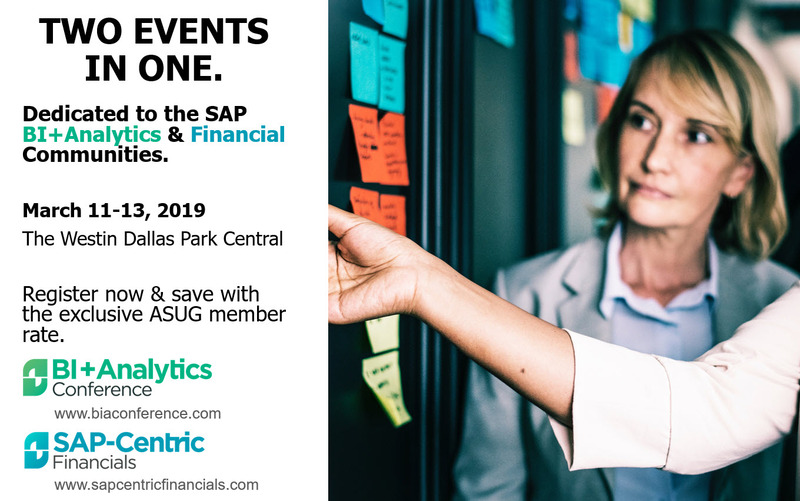 This month, we provide an update on the BI+Analytics Conference, request your feedback for the ASUG Business Intelligence Community, and bring your attention to several webcasts, an opportunity to influence, and upcoming events. The ASUG Business Intelligence Community needs your help. We are conducting a membership survey to help us assess the level of satisfaction with the services we provide and ways we can improve. We want to provide services that are important to you, refine those that need improvement, and introduce new services that address your goals. We realize you have many demands on your time. This short survey can be completed online in three to five minutes. Your input is important to us, as responses will help us better meet the needs of our members. Please complete the survey by Dec. 14. A few submissions will be selected randomly for prizes. The BI+Analytics Conference is North America’s go-to event for today’s best SAP strategies and technologies for business intelligence and analytics. Learn proven best practices and lessons learned directly from leading companies in a live event. Speakers at the BI+Analytics Conference leverage SAP’s full range of analytics and reporting tools, and the newly announced speakers showcase success stories from Crocs Inc., Benjamin Moore, Borchers, Kimberly-Clark, and more. This ongoing council is reaching out to SAP Mobile users in its continuing efforts to influence the future road map of all the mobile analytics applications—SAP Analytics Cloud Mobile, SAP® BusinessObjects™ Mobile for BI, and SAP® Roambi®—by providing feedback, identifying and discussing pain points, and brainstorming ideas to improve the applications. As a valued member of the ASUG Business Intelligence community, we wanted to let you know of some upcoming webinars that may be of interest to you. In addition to providing insights from SAP’s most respected voices on the most relevant and important topics today, these webinars help you earn continuing professional education (CPE) or PDU credits, depending on your area of certification. Keep in mind you can always watch the archived webinars later, and we offer an extensive library of on-demand webinars you can explore: ASUG BI Webcast Recording/Slides Reference List for 2018. For a list of our 2018 webinar recordings and replays, please see this link. 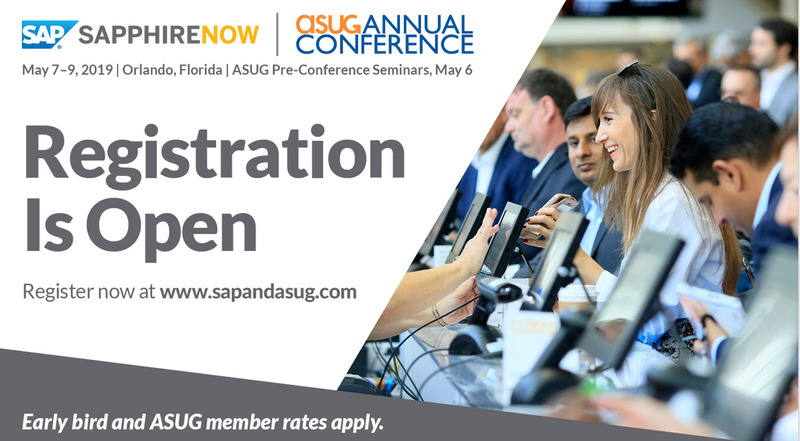 SAPPHIRE NOW® and ASUG Annual Conference is May 7–9, 2019, in Orlando, Florida, where the focus will be on helping you find solutions to your business challenges. ASUG members receive discounted registration. Consider planning your trip to include an ASUG Pre-Conference Seminar on Monday, May 6. We hope you enjoy the rest of 2018, and we look forward to working with you in 2019.